The Australian’s fiery temper has come to the fore already in south Florida after raging at the chair umpire during a doubles match, declaring that he was a “f***ing disgrace”. And Kyrgios allowed his frustrations to get the better of him in the first game of his first set against Lajovic in the third round of the men’s singles. 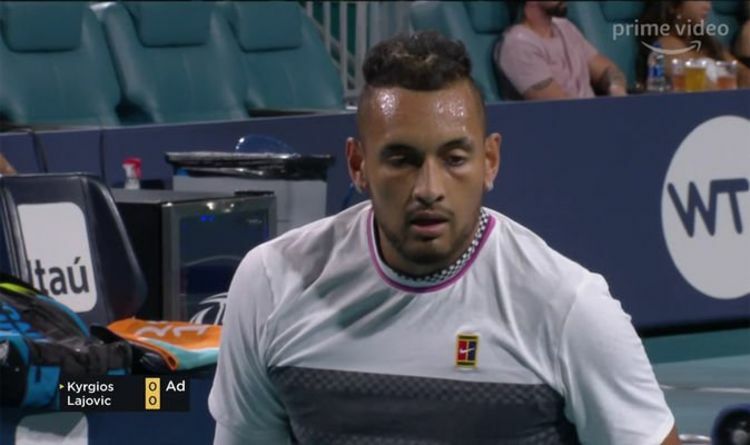 And the co-commentator declared that Kyrgios must ensure he keeps a check on his behaviour after previous events in Miami this week. He said: “I think the umpire must be the only person that didn’t hear it. Perhaps he’s just letting him off with one. “He’s possibly in trouble with the tournament already Kyrgios, he needs to be careful. Kyrgios won the match in 57 minutes – coming out on top 6-3, 6-1. But his early profanity was not the only controversy of his defeat of Lajovic. The 23-year-old argued with the chair umpire but even more remarkably, got into a heated exchange with one fan in the stands. The altercation began after Kyrgios went 4-1 up in the first set, with a male fan sat behind him riling him with a comment. The man was later escorted away from his seat with Kyrgios going on to win in 57 minutes to progress to the fourth round. He will, however, hope for a less contentious match next time out having hit the headlines numerous times for his behaviour in south Florida already in recent days.